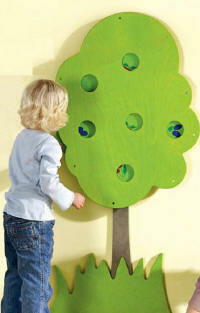 Attractive playwalls invite sensory exploration and discovery. 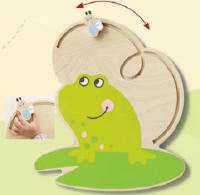 Turning, pushing and touching the wooden elements trains fine motor skills and perception while playing. The playwall panels can be used individually or in a customized combination that transforms any space. 10 Year Manufacturer's Warranty. Birch wood stained. Includes mounting hardware. Themed playwalls geared towards toddlers and preschool/elementary children. Birch and Plywood. SCROLL THE PAGE TO VIEW SELECTIONS. 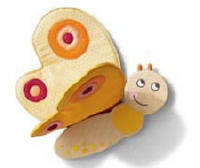 The textile wings are flexible - one rustles, one rattles. W 9 3/4" X H 10 3/4"
Claws are removable. W 10' x H 10 3/4"
The various materials make a variety of sensory experiences possible. W 13 3/4" x H 16 1/4"
Turtle legs have a tilting mechanism. W 14 1/2" x H19"
H053296 - ORANGE BIRD - W 10 1/4" x H 8"
H053294 - GREEN BIRD - W 5 3/4" x H 9 1/2"
H053295 - BLUE BIRD - W 7 3/4" x H 6"
The starfish can be moved, turned or tipped. W 16 1/4" x H 26 1/2"
Small printed swans are hidden behind the hinged textile wing. W 17 1/2" x H 17"
With facet surfaces. W 13" x H 14 3/4"
With colorful pushable scales. W 11 3/4" x H 14 1/4"
With sparkly textile wings. W 12" x H 12"
Frog with movable fly. W 16 1/4" x H 18 1/4"
Cattails made with soft fabric. W 16 1/4" x 27 1/2"
W 141/2" x H 9 1/4"
Inside the Shell is a facet surface pearl. W 8" x H 9 1/2"
Consists of one large and one small seahorse. Small Seahorse is W 3 3/4" x H 16 1/2". Large Seahorse is W 12" x H 14 1/4"
W 12 1/2" x H 8 3/4"
Its tentacles have mirrors of artificial leather appliques with mysterious fillings that squeak, rattle or rustle. W 12 1/4" x H 23"
W 12" x H 10"
Coconut fibre mat. W 12 1/4" x H 7 1/4"
Sunflower with Little Bee that moves around the flower. W 12" x H 32"
W 6" x H 7"
W 18 1/2" x H 27 1/2"
With bell and fluffy wool to touch. W 16 1/2" x H 12 1/2"
Raindrops made of solid beech wood with various colored facet lenses and steel cords. Size - without droplets - W 26" x H 18 1/2"
H121000 - RED FLOWER - W 9 1/2" x H 29 1/4"
H121001 - YELLOW FLOWER -W 9 1/2" x H 29 1/4"
H121002 - ORANGE FLOWER - W 10 1/4" x H 30"
Red and Yellow Flower same size, Orange Flower a little wider. One Section - 39 1/2" x H 11"
Plays a melody when moving the blossom. 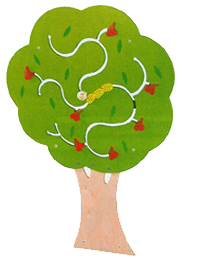 W 16 1/2" x H 19 1/2"
The Mole slides up and down Birchwood - W 11 1/2" x H 8 1/4"
W 12 1/2" x H 32 1/4"
By turning the wheel, little farmers can harvest apples, plums or cherries. W 29 1/4" x H 43 3/4"
With five mirrored droplets made of acrylic mirror, the smiling cloud will brighten up any wall -acrylic mirror. 21"H x 13"W- without droplets. Who is hiding in the grass. It's the Rabbit and the hedgehog. With 5 sliding Elements. W 34" x H 71"
The Sun brings a little bit of summer into any room even if it is storming or snowing outside. 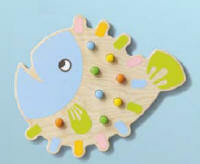 A briliant decoration for wall or furniture. 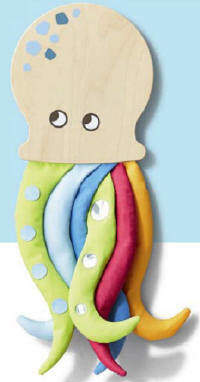 Includes adhesive srip for fastening 11"